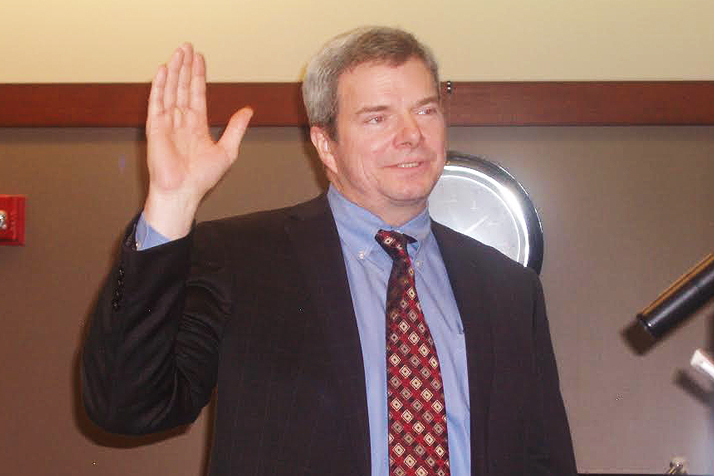 Matt Zimmerman taking the oath of office Monday. Photo by Jerry LaMartina. On Monday, Shawnee resident Matthew Zimmerman took the oath of office as a new councilman representing Ward 1, his first experience in elected office. Moments later, he became president of the entire council and next-in-line for Shawnee mayor should Michelle Distler no longer be able to serve. The election of a brand new member to become council president just minutes after he was sworn into office has raised some eyebrows around Shawnee City Hall, with some elected officials questioning whether Zimmerman has the experience necessary to fill the role, and at least one citizen wondering whether councilmembers must have discussed the idea of nominating him for the position beforehand, thus violating the Kansas Open Meetings Act. Shawnee resident Ray Erlichman posted a piece on his blog Wednesday suggesting that some of the councilmembers who voted in favor of Zimmerman as president — Jim Neighbor, Mike Kemmling, Justin Adrian, Mickey Sandifer and Lindsey Constance in addition to Zimmerman himself — may have communicated about nominating him before Monday’s meeting, which would have constituted a KOMA violation. In response, City Attorney Ellis Rainey conducted an investigation. After speaking with the three new members as well as Neighbor, who seconded Adrian’s motion to nominate Zimmerman to the presidency, Rainey determined no KOMA violation had occurred. Erlichman has indicated that he is pursuing the matter with the district attorney’s office. Still, Zimmerman’s lack of council experience has left some of his governing body peers concerned. The council president is next in line to become mayor if the sitting mayor becomes unable to serve, and the president leads council committee meetings. Both Ward 2 Councilman Eric Jenkins and Ward 3 Councilwoman Stephanie Meyer voted against Zimmerman as president. Jenkins said that he didn’t know why Zimmerman was elected president and that he thought there was no benefit in having a council president with no council experience. Meyer said that she had great respect for Zimmerman and considered him a friend, but that she believed the role should be filled by someone who understands the inner-workings of the governing body, especially during what will be a busy year for the city as it tackles big issues like its economic development policy and hiring a new city manager. For her part, Distler said the election of a freshly sworn in council member as president was unprecedented in her time with the city, and that Zimmerman’s election surprised her and caused her some concern. Neighbor, who was council president in 2013 and 2014, said he has known Zimmerman through the Shawnee Rotary Club for a number of years and that he thought Zimmerman would do a good job. Zimmerman himself acknowledges that he has a “steep learning curve” ahead of him, and said he was caught off-guard and a bit apprehensive about being nominated for the council presidency. He even said he believes that council should review the process for electing the president. But he added that he hopes lack of “baggage” could be an asset in the role. “Part of what drove me to run for the council is I thought I could provide a higher level of harmony,” he said.